Inbound marketing consists of a mid to long-term methodology to attract, educate and convert marketing and sales opportunities through a series of steps in the digital world. Those three words – Attract, Educate and Convert – highlight the importance and dependence of such strategy from content marketing. There’s no attraction without content, there’s no education without content and there’s no conversion without content. Content operates in all spheres of inbound marketing and, more importantly, is what makes it stand out from other methodologies. It is what makes it sustainable. Conversion: After finding out about an issue, learning about it, knowing how to solve it, it’s time to make a decision. Firstly about how to solve it (which path) and secondly, who will solve it (which provider). That’s the time where you present your product, its benefits, its features and its pricing. Note that if you haven’t connected with this visitor before and he has just found out about you, there’s a huge chance he already trusts another brand – the one who has taught him all of that – and it will be a lot harder for your brand to stand out. What about sustainability, how does this concept fit here? No, I won’t try to argue that once you are creating content online and not using a piece of paper you are protecting the environment – although that’s also true. Actually, when I affirm that content is a sustainable strategy, it is because differently from other strategies, such as an event, paid media or an outbound campaign, its growth is not punctual nor does it dependent of future investments. Content growth is recurring and independent of future investments – that’s why we consider that content marketing is a PG (geometric progression) not a PA (arithmetic progression), because it grows exponentially. If you run an ad campaign, you will be paying a certain amount of money per click. If you stop paying, your ad will stop showing up. If you run an outbound campaign, you will be reaching out to a certain amount of prospects. If you stop reaching out, they will stop showing up. If you create an event, you will spend a certain budget on it. Once the event is done, no one will show up to watch anything. In the opposite spectrum, let’s say you’ve invested U$100 to create and distribute an article. During the first week, you’ve got 50 visitors, which indicates a U$2 per visitor. On the second week, you’ve reached 50 new visitors, which takes your investment down to U$1 per visitor. On the third week, you’ve reached 100 extra visitors, which makes your investment drop to U$0.50 per visitor. By the end of the month, the total number of visitors went up to 1000! The result? A cost of U$0.10 per visitor. 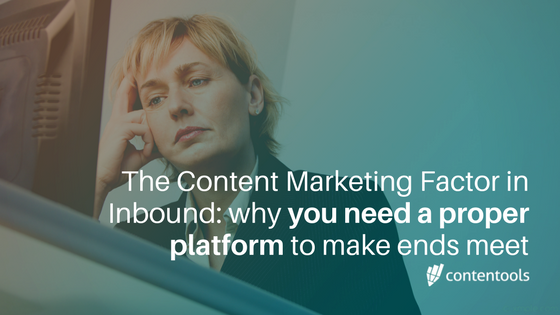 Do you actually need a content marketing platform? You don’t start building a house without having a land to do so. In the same way that you could get all functionalities of a marketing automation platform by mixing different tools that do not communicate with each other and soon become a #frankstool (impossible to explain, train new member, find information or scale), you could also find all functionalities of a content marketing tools by using a dozen non-specific platforms for it. But is it worth the effort? You have one platform that centralizes, organizes and automates it all under the same roof – built, designed and constantly updated precisely to empower you. As fancy as it may sound, having a content marketing platform to manage your content in addition to your inbound marketing platform is not a luxury, it is a necessity that sooner or later will pop up. It can be later enough that you will have to triple your investments and efforts to adapt an already unproductive team (and a Frankenstein process) to it. Or it can be soon enough so that this software becomes your only necessary resource to work your magic and get your content machine to be your main (and cheaper) acquisition channel. Would you like to check out Contentools (our Content Marketing Platform) and see if it would fit your needs? I can personally give you live demo, feel free to shoot me an e-mail and we’ll schedule the best moment for it. How neuromarketing can act within inbound marketing? Marketing Heroes Series: Soso Sazesh on SEM & more!